.....an oft debated point to be sure, but to save some time I'd recommend performing a "search" here for "timing gears" (or similar) and you'll find quite a lot of discussion on this topic over the last 15-ish years on this forum alone. 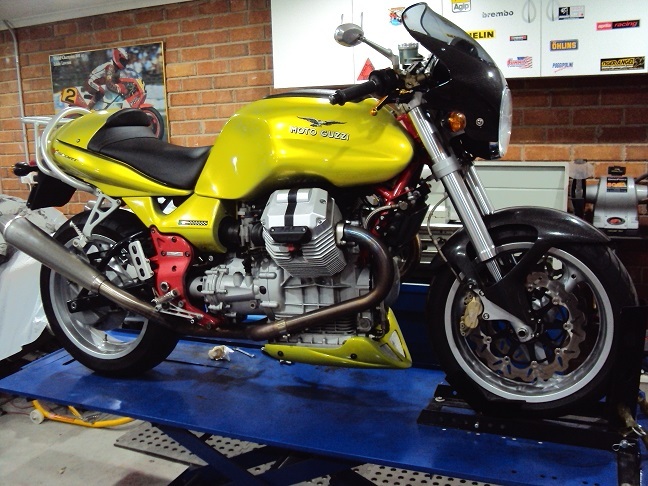 Similar discussions have been going on in other Guzzi forums for probably longer as well. But in summary, you are right in that the consensus is that gears probably have very little practical benefit on a street bike, and the V11 chain is accurate enough and reliable. However, the chain tensioner does wear, there is a likely tiny bit of timing accuracy gained with the gear, but both are probably too minor an issue to detect or worry about. But for many they are just "neat" especially audibly. So, essentially it is just for fun ...but that's the point isn't it? The other general consensus is that if one does install gears, do not use aluminum gears, only use steel gears. And as far as I know, Joe Caruso is the only one making those for the V11. Is there more or less inertia in a gear system, I remember drilling out cam drive sprockets to lighten them as the 'thing to do'. Less inertia in a gear system. Gears are just "cleaner", no tensioner, no chain wizzing around changing direction and wearing out. A quality cam gear drive will outlast the engine easily, give more accurate timing and make your shirts whiter than white. A chains major benefit is its cheap and easy to manufacture, its quieter, its easier to adapt to a design than a gear driven system. There's a reason the vast majority of manufactures dont use gear driven cams......its just to damn expensive and when we are living in a world where the modern engine designer even eliminates key ways cut into cam drive sprockets cams and cranks to save a machining operation and the cost of a key whats the chances of them making bespoke cam gears. Not sure what they will sound like to be honest. My RC-30 Honda and my VFR750 both had gear driven cams but you need to remember those systems used a spring loaded backlash gear arrangement to make them quiet for road use. Well got it done and dusted. While It was up on the stand with the tank off I pulled the airbox and fitted the gearbox support as well so that's another job off the list. The bike started right up with oil pressure even before it fired which was nice considering I had drained the oil cooler. The gears are almost silent, I can hear them hot and cold but I'm listening for them. When its hot you can just hear the sound of meshing gears whirring around which sounds rather cool to me. Couple of things, the idle went up by a few hundred rpm. I have my idle set fairly high at just under 1200 rpm on the Vaguelia and after the install I had around 1400-1500 rpm indicated. No loose hoses or any other obvious issues so I took it down on the idle screw. The bike ran fine and I'm trying my best to be objective here but it was maybe a little bit more responsive. It seems to respond to the throttle a little sharper, not night and day but it seems sharper. I had read a long time ago ( with some skepticism I might add) the theory that the old floating throttle hiccup was caused by timing chain slack so I was interested to see how this went. My bike has always done this at or around 3200 rpm while cruising on the flat with just a whiff of throttle, maybe 2-3%, just off the stop. It would cough once every klm or so. I don't ride in the hiccup zone much so I wasn't bothered to chase it down. On the test ride I tried my hardest to make it hiccup and cough but without any success. The jury is still out on this I'll see how it goes in different atmospheric conditions. Now THAT .....being potentially hiccup free, is interesting. Definitely test that further and let us know. That 3k cruising hiccup is one of the little frustrations I had with the V11 that never was fully sorted out. If the gears clear that up, that actually would make the gears more than just a "nice to have" consideration. Well spent a whole ride today trying my very best to induce a cough or hiccup but it just wouldn't do it. Maybe it is timing chain slack that is the reason. doccs got a lot of miles up and I assume his has some chain slack by now, wonder if his does it?....docc? Well . . . I have chased many a Nasty Hiccup on the old Sport. Right now, I am closing in on my next 5,000 mile tune-up/oil change at 110,000 miles. She is just running so fabulously! I can get her to lug at 2,000-2,500 if I coax her into it, but I feel like I'm making my tango chick stuff herself into a waltz. Sure, she'll do it, but it kinda pisses her off. This one docc is at around 2800-3000 rpm under just a wiff of throttle but in 3rd gear, not lugging it at all. It will just cough and miss a beat every klm or so under those conditions. Resolved with the timing gears? Do not see how changing to timing gears can help smooth running, unless of course the timing was way off before. These occasional coughs seem to affect fuel injection more than carb bikes. I feel it is likely to be due to running at the edge of a fuel map cell. A light change in rpm, throttle etc may make it jump one way or the other, rich or lean, and so be momentarily wrong at that instance. Our ECU's don't have many cells so the 'jump' is more noticeable than on modern bikes. A carburetter is an analogue device so the fuel metering has an infinite solution to supply fuel at the correct mixture. Fuel injection is digital of course and so moves in a series of steps, the cheaper the system the larger the steps. It appears so docc. I read years ago of the theory from many that experienced the same and couldnt tune it out that it was down to timing chain slack affecting the ignition pickup. I was skeptical so was wondering does yours do it seeing it has a quite a few miles up?